NEW YORK (WABC) -- It was a dream honeymoon down under, but at a deep discount. Brianna and Steven Knox were pictured in a dazzling photo snorkeling in Fiji, hiking New Zealand's glaciers and over Australia they did a tandem skydive. The groom's mom paid for half the trip with 100,000 American AAdvantage miles. But when the newlyweds showed up to check-in at JFK they ran into trouble. "They asked me if I canceled or postponed my ticket and then they proceeded to tell me I don't have a seat," Steven Knox said. There was no record of Steven's ticket, booked through American last February and confirmed from the airline via email. "We were freaking out," Steve said. He says American would only rebook if his mother personally reconfirmed the use of the reward points. There's one catch, "It just so happens my mom was on a flight to St. Louis at the time," Steve said. "So reaching her was impossible." "American told us that there's absolutely nothing we can do," Steve said. 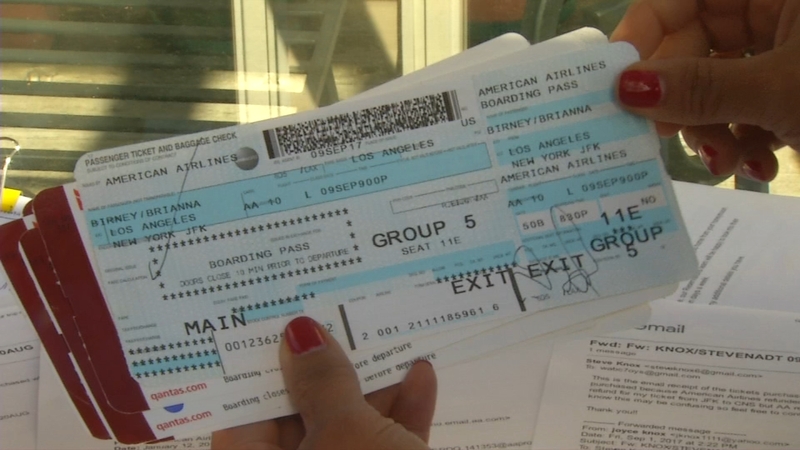 The airline issued the couple a pair of $300 vouchers. "They still haven't provided a reason it was dropped," Steve said. Well that didn't fly with us so we contacted the carrier. And within a day, American reached out to Steve with some great news. "They sent me a check for $4,100. Then I asked about the miles and they said that's going to be on the house," Steve said. The points were returned to the account plus a full refund. "Thank you.This couldn't have happened without you," Steve said. "After a comprehensive investigation, we missed the mark with regard to Steve Knox's August 2017 trip. The original reservation was flagged for potential fraud, which should have resulted in a phone call from American Airlines prior to departure. Unfortunately, we don't have any record of reaching out in advance, which is our standard protocol. Due to the circumstances, we are in touch with Mr. Knox, and will reimburse him the charges he paid for booking on Qantas and Fiji Airways directly. Previously, American refunded the 100,000 AAdvantage miles and provided travel vouchers - which he can keep - and hopefully use in the near future. We want to congratulate Steve and Brianna on their marriage, and we look forward to welcoming them on a future American Airlines flight. We do apologize for the error."